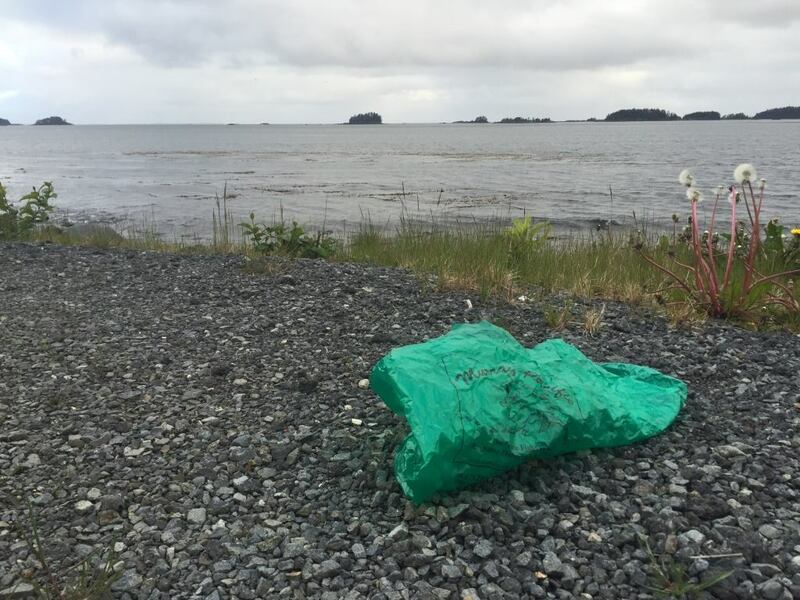 Sitka will not be placing restrictions on plastic bag use. By a vote of 6-0, the Sitka Assembly indefinitely postponed voting on a single-use carryout bag fee on Tuesday night (09-25-18). The measure was intended to disincentive use of plastic bag and change shopping habits locally. The Sitka Assembly also approved issuing state revenue bonds to finance renovations at Crescent Harbor and the Rocky Gutierrez Airport. The idea for the ordinance (Motion and Ord 2018-47) was pretty straight forward: charge Sitkans a flat fee for single-use bags–15-cents for plastic bags and 10-cents per paper bag– at check-out. The money collected would go into the general fund. The ordinance passed muster with the Sitka Assembly on first reading two weeks ago (09-11-18) by a vote of 4-2, with Steven Eisenbeisz and Aaron Bean voting against. But this time around, the winds had changed. During their regular meeting Tuesday night (09-25-28), Assembly member Kevin Knox made a motion to indefinitely postpone the ordinance. It was unanimously approved by the Assembly, by a vote of 6-0. Assembly member Steven Eisenbeisz was absent. Assembly members Knox and Wein expressed verbal interest in developing another version of a plastics ordinance within the year. Comments like that gave even the sponsors pause. Kevin Knox: You always think you might be able to gauge the amount of correspondence we might get on any particular issue. This one I was way off on. Richard Wein: I was thinking, ‘Fifteen cents a bag. That may not be so bad.’ But as it turns out, people thought it was very bad. All on the Assembly supported plastics reduction in some fashion, recognizing the disastrous impact plastic pollution has on the marine environment. But Assembly member Ben Miyasato worried about how a fee would further harm the lowest income Sitkans. “Fifteen cents doesn’t sound like a whole lot to some of you. But to others, that’s the difference between whether or not they’re going to be able to get more food or starve,” he said. Mayor Matthew Hunter worried about the accounting work a fee creates for small business. Other communities in Alaska, including Anchorage and many cities in Western Alaska, are banning plastics altogether. Several on the Assembly wondered aloud if Sitka should follow suit – pursuing a plastics ban instead of a plastics fee. With the Assembly’s postponement, nothing about plastics will change anytime soon. The postponement kills the ordinance, but the spirit of the idea was still alive at the table. Assembly members said they hoped the legislation could be re-crafted — made more palatable to a great number of Sitkans — and brought forward again at a future date. Mayor Matthew Hunter asked for a commitment from Knox and Wein to develop a new version of the legislation within the next year. They verbally agreed. “I am encouraged to hear that Dr. Wein that you are willing to continue to work on it. I’ll work on it with you as well,” Knox said. The citizens group, Bags for Change, has been marshaling support for plastic bag reduction for over two years, handing out reusable bags and coordinating with local businesses. They approached the Assembly with the notion of a plastic bag fee in February. After the Assembly’s decision to postpone, I called organizer Michelle Putz. She said her disappointment has a silver lining. “I’m sad that it hasn’t moved forward. But in a way, by it not moving forward, people are learning and maybe even changing what they’re doing because of it,” Putz said. Meaning a change in plastic-use behavior. Moving forward, Putz said she would support the Assembly in any legislation they introduce. “I think [Bags for Change] would be happy to see a plastic bag ban in Sitka. It will probably have to include a fee on paper. But, seeing as people were really concerned about the city collecting it, I would be happy to see that [money] go to the businesses to offset the costs,” Putz said. Any plastics legislation, however, depends on the will of the future Assembly. The municipal election is Tuesday, October 2nd. Two seats on the Assembly and the Mayoral seat are up for election. On October 9th, the election results will be certified and the new Assembly members sworn in, with Hunter passing the gavel to the new mayor. The Sitka Assembly also approved issuing state revenue bonds for capital projects. By a vote of 4-2, with Richard Wein and Aaron Bean voting against, Sitka will pursue two bonds from the Alaska Municipal Bond Bank. To bolster the Crescent Harbor project, the state has offered Sitka a $5 million matching grant. The entire project costs an estimated $13 million. The second bond, not to exceed $4.5 million dollars, would go towards renovating Sitka’s Rocky Gutierrez Airport. The city plans to pay back the bond through passenger facility charges (PFCs), which amount to $4.50 per enplaned passenger. The project seeks to expand the passenger holding and baggage handling areas. Over the phone, David Thompson, the City and Borough of Sitka’s Bond Counsel, answered technical questions. –Approved selling Lot 23 at the Gary Paxton Industrial Park by an invitation to bid process. The lot houses the former administrative building of the Alaska Pulp Corporation and was damaged by a landslide in 2015. GPIP Executive Director Gary White said, “It’s a non-performing city asset and a liability.” He estimated it cost GPIP $30,000 to $50,000 to maintain and hoped another business could find a use for the lot. –Received a reminder from City Administrator Keith Brady that the sales tax will be 5% and utility rates at 12-cents per kilowatt hour beginning October 1st. The new director of Sitka Public Library will also begin October 1st. –Entered executive session at the end of the meeting around 9:35 p.m. to hear a report from city staff on their month-to-month contract with the Greater Sitka Chamber of Commerce to manage visitors services. When the Assembly reconvened around 10:10 p.m., no motion was made and the Assembly adjourned. Earlier in the meeting, Chamber Executive Director Rachel Roy announced that Sitka will host the 2019 Southeast Conference. In a previous version of this article, we incorrectly stated that Richard Wein and Aaron Bean voted against the plastic bag ordinance on first reading. The “no” votes were Steven Eisenbeisz and Aaron Bean.